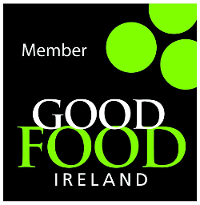 Janet’s Country Fayre produces private label products for Retailers such as Mc Cambridges of Galway, The Butler’s Pantry, Renvyle House Hotel, Derry Clarke for Grazerfield, Glenstal Foods and Red Earth, Mullingar. 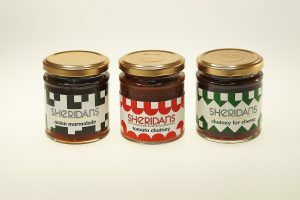 Janet’s Country Fayre also has a particularly creative partnership with Sheridan’s Cheesemongers having created their signature Chutney for Cheese, Onion Marmalade & also their Chutney for Everything. We also produce their seasonal Christmas chutney. Sheridan’s Cheesemongers – Chutney for Cheese. This product is made with apples and plums and is produced for Sheridan’s by Janet’s Country Fayre. We took a traditional recipe; we did a bit of tweaking and we did a lot of tasting. Finally we came up with this really tasty chutney, which makes a truly delicious accompaniment for all types of cheese. Sheridan’s Cheesemongers – Onion Marmalade. This product is great with cheeses and meats and is produced for Sheridan’s by Janet’s Country Fayre. We’ve spent a long time perfecting the recipe for this most delicious onion marmalade. Subtly seasoned and slow cooked; it takes Janet hours upon hours to prepare each small batch! We couldn’t be more delighted with this addition to our Sheridan’s chutney range. Super with a variety of cheeses and salamis. For an extra special treat, try it along with some pate and crusty bread. Sheridan’s Cheesemongers – Chutney for Everything. Versatile, delicious and full of tomatoes, Sheridans Chutney for Everything brings together produce from some old family friends. Plum tomatoes from Prunotto organic farm in the Piemonte hills in Italy, cider vinegar from Con Traas apple farm in Tipperary, Irish bramley apples and Galway Bay carrageen moss, Eat with everything!